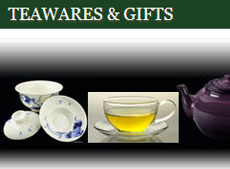 Many sites online give definitions of “hyson” that say, almost without exception, it is a green tea from China. Some say it has two grades: young hyson from the early crop and hyson skin made of inferior leaves. Others say it has three grades: Mi Si, Cheng Si, and Fu Si. The term is based on hei-ch’un (Cantonese) which means “bright spring” or “flourishing spring.” The main location where this tea is grown and processed is Anhui province, but it also comes from other locations in China, including Zhejiang province. Not one of them says that the green tea from Sri Lanka is part of this category. 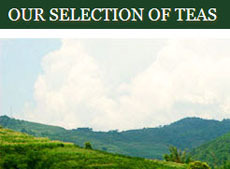 It seems to be a term that the Sri Lankan tea industry just glommed onto to promote their green tea. Nothing wrong with that as long as you keep in mind the difference. Anhui version: Grayish green color. Large, loosely twisted tea similar to FOP of Orthodox Manufacture, but could contain a few stems. Eastern China version: Uses young leaves from high altitudes picked before the spring rains. The leaves are wok fired to prevent oxidation and during the second wok firing are hand-rolled and tightly twisted. The resulting tea brews golden-yellow with a slight sweetness from the young leaves and a robust flavor uncharacteristic of most green teas. This was one of the tea types thrown overboard in the Boston Tea Party. A medium-quality tea from many provinces, an early-harvested tea. A classic green tea from Putuo Island, off the coast of Zhejiang province. The leaves are curly and pan-fired and brews a light amber-green cup with surprising strength and body for a green tea. 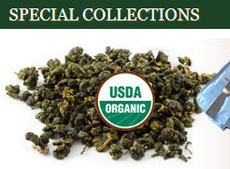 A green tea made with twisted leaves that unfurl during steeping. This tea has forgiving steeping conditions and makes for a soft grassy flavor, very amenable to novice green tea drinkers. 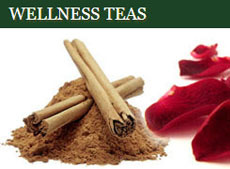 Generally, hyson tea is thought of as a low-grade or mediocre quality tea. However, young hyson is considered high quality, is harvested earlier (before the rains), and has a full-bodied, pungent taste, and golden color. 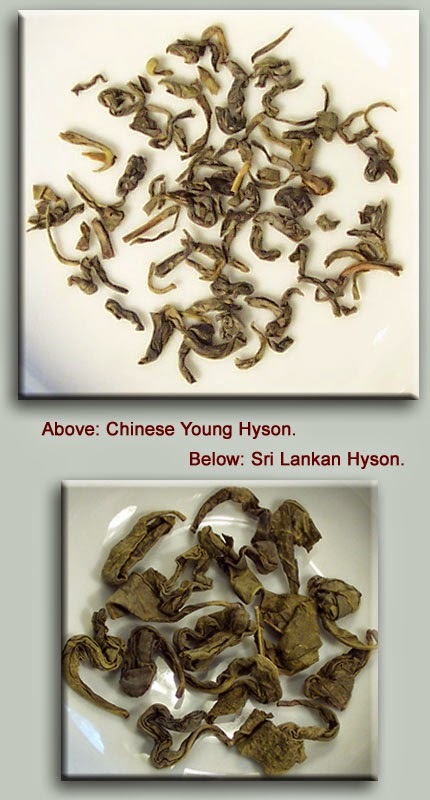 Young hyson tea is subdivided into Chun Mee (a hard, small, twisted leaf), Foong Mee (a long, large, curly leaf), Saw Mee (a small, non-hard, twisted leaf), and Siftings. A wonderful Chinese green tea that comes from the Anhui and Zhejiang provinces in China. It distinguishes itself from other green teas by the way the leaves are twisted and shaped. The version from Sri Lanka is made of tougher, darker colored leaves, and in the dry form is shaped more like wads than fine brows. The flavor, though, is known to be quite pleasant but different from the Chinese versions. It can have a seafood quality to it, according to some tea reviewers. Whichever kind you try, steep it gently in water no hotter than 175°F for 1 to 3 minutes. This entry was posted in Green Teas and tagged chinese tea, Green Teas, hyson, JAS-eTea. Bookmark the permalink.